As the saying goes, timing is everything. Human beings tend to brood and get nostalgic around the winter holidays and as the year closes. In contrast, summer is when it feels most appropriate to brush the cobwebs out of one’s mind, let one’s hair down and kick the shoes off and all cares away. That’s the kind of thinking I’m assuming led to New Jersey band Dentist’s thinking to release their debut album ‘Night Swimming’ in the middle of July. 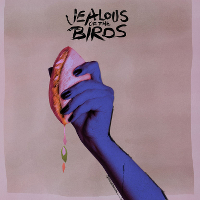 Feeling at times like having an ice cream at the beach but never proving too cloying, it’s an upbeat LP that at times flirts with bubblegum pop territory. In some ways similar to Katie Ellen’s ‘Cowgirl Blues’ that was released this time last year, ‘Night Swimming’ conveys the thoughts of an independent woman with an agile mind, bolstered by surf-y, lo-fi guitar chords that lend a scrappy, ‘skinned knees’ kind of quality to the proceedings. Most of the songs on this album are short – around the 3-minute mark or a good deal shorter – which means if you’re not a fan of frontwoman Emily Bornemann’s twee vocal pitch, it never stays around long enough to bother much during a collection of songs that, taken together, barely pass the 30-minute mark. The animated and simply fun rock guitars and drums throughout also provide a worthy distraction. Things get off to an exuberant start with ‘Upset Words’, on which she asks cheekily, “do I make you proud?” On fun lead single ‘Corked’, Bornemann’s sweet and girly vocals are an asset here, providing an interesting juxtaposition to the introductory strummed guitar notes, scuzzy with feedback and audible clicks left in and not polished off the record. “Something’s wrong again ‘cos we’re still friends”, she wistfully scoffs in the first chorus before the muscular part of the song gets going. LP standout ‘Figure-Four’ should be our credo for the rest of 2018, with its suggestions to let it go and don’t sweat the small stuff. Bornemann sings, “it’s okay / every day / we’ll be fine / I’m sure, I’m sure” and its entreaties to “accept your fate”, it’s Dentist’s way of saying trust in the process of the Great Big Thing called Life. We need more of this thinking. Too many bad things are happening around us and to us that sometimes we all forget that we’re here to live. On the simply titled ‘Oh’, she quips, “wish that I could turn my brain off / then that would mean that I am dead”. The instrumentation going with it is so peppy, you have to ask yourself if the lyrics are meant to be rhetorical to the listener or if they’re meant to be droll or even possibly cutting observations that hide her own anxiety about life and relationships, something the Crookes did so well. ‘All is Well (In Hell)’ sees Bornemann on a brief but lovely, slower, acoustic interlude; it’s a bit soppy and entails her begging her lover not to leave her because “that is worth than anything”. Dentist get down and dirtier for a brief moment on the minor key ‘Tight Spot’, with squealing, surf-y guitars and harder hit drums to go along with the existential lyrical musings. In the rapid fire drumbeat-driving closer ‘The Latter’, Bornemann implores, “I have opened up to you / you have done the same / tell me now what I can do / to make this great escape”. With an album like ‘Night Swimming’, you are invited to give someone else control of the steering wheel. This is the kind of music to listen to on those long drives out to the coast by day and into the steamy summer evenings when there’s nothing to do. Or at least you’re pretending there isn’t. This is one Dentist that won’t make your teeth ache. ‘Night Swimming’, the debut album from New Jersey’s Dentist, is out tomorrow, the 20th of June, on Cleopatra Records. Read my review of them at SXSW 2018 through here; they were one of my unexpected finds in Austin this year.